Radio zhakkas Marathi Online . It is the First Marathi Web Radio of India . 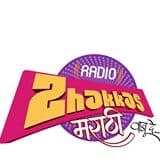 Radio Zhakkas Marathi network has more listing options than any other radio of the Country.It is One place to get back to your roots and relish the rich Marathi Songs, Marathi Movie Songs , get latest update of Marathi Music and much more. It has Various Genres and Artists of Music’s and Daily gupshup talk of the Rj’s. It plays about four times more Music from all the independent and Private Artists than the other FM do. It plays all the Music Genres which you are not able to listen on the other radios on your Demand. Address : Plot No. 3, 2nd Floor Sanghavi Nivas, Saket Nagar, Dhadiwal Lay-Out, Near Indrayani TVS Show Room, Suyog Nagar Square, Nagpur 440027 .